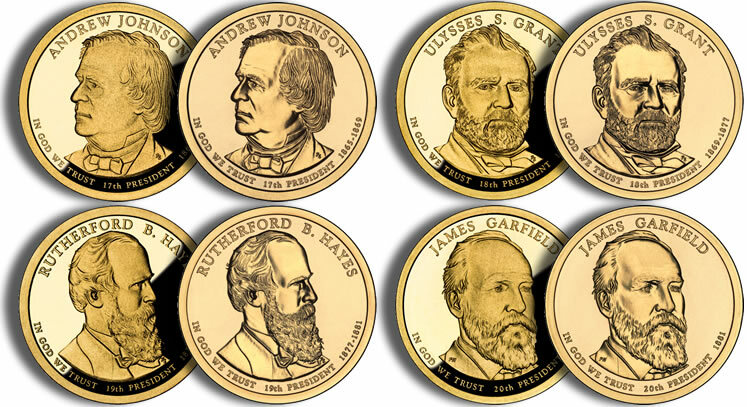 The 2011 Presidential $1 Coins honor the former Presidents of the United States by featuring their portrait on the obverse of one dollar strikes. 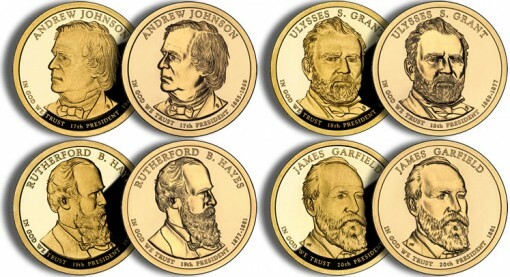 Those honored on the 2011 releases include Andrew Johnson, Ulysses S. Grant, Rutherford B. Hayes and James A. Garfield. 2007 served as the inaugural year for the program which was authorized by the Presidential $1 Coin Act of 2005 (Public Law 109-145). Under the program, four dollars are issued annually until all of the qualified individuals had been honored. The coins were scheduled in the order in which the individual served in office. These dollars are typically produced by the United States Mint for general circulation. However, the United States Mint also strikes proof and uncirculated qualities for inclusion in special annual sets. Andrew Johnson Presidential $1 Coin – Johnson served as the seventeenth President of the United States from April 15, 1865 – March 4, 1869. This dollar was issued on February 17, 2011. Ulysses S. Grant Presidential $1 Coin – The eighteenth US President Ulysses S. Grant was in office from March 4, 1869 – March 4, 1877. This dollar was issued on May 19, 2011. Rutherford B. Hayes Presidential $1 Coin – Released into general circulation on August 18, 2011, the Rutherford B. Hayes dollar honors the nineteenth chief executive who served from March 4, 1877 – March 4, 1881. James A. Garfield Presidential $1 Coin – President for only 200 days from March 4, 1881 – September 19, 1881, Hayes was the twentieth US President. His dollar was released on November 17, 2011. The US Mint also has an associated First Spouse Gold Coins series that is produces honoring the spouses of the former US Presidents. These precious metal coins are each struck from one half ounce of 24-karat gold. Copyright © 2007-2013 CoinNews Media Group LLC. All data and information provided on this site is for informational purposes only. CoinNews makes no representations as to accuracy, completeness, correctness, suitability, or validity of any information on this site and will not be liable for any errors, omissions, or delays in this information or any losses, injuries, or damages arising from its display or use. All information is provided on an as-is basis.